The creative landscape designers at Matteo's Landscaping based in Southwest Ranches, South Florida will develop a complete commercial landscape plan that will make your landscape functional, beautiful and pleasing. Our designers draw upon design elements such as axis, line, landform, horizontal and vertical planes, texture, and scale to create aesthetic variation within the landscape. We design landscapes for municipal properties, retail spaces, office parks, homeowner associations, corporate campuses, industrial parks, hospitals and other commercial properties. 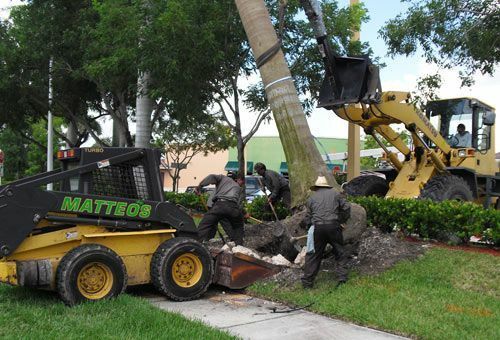 Whether you are a property developer, owner or manager, Matteo's Landscaping can handle any type of enhancement project in Weston, Pembroke Pines, Coral Springs, Fort Lauderdale, Plantation, Sunrise, Boca Raton, Delray Beach, Boynton Beach, Sunny Isles, Miami and throughout Broward, West Palm Beach and Miami-Dade counties. Your particular goals and wishes with an on-site design consultation and evaluation of landscape properties. Managing the storm water runoff from rooftops, driveways, parking lots and roads on your property. Hard landscape, such as paths, walls, water features, sitting areas and decking. Outdoor/landscape lighting considering various types of lighting techniques such as uplighting, down lighting, spot lighting, shadowing, sign lighting, walkway lighting, fountain lighting, pond lighting and more. Plant material with consideration for their horticultural requirements, their season-to-season appearance, color, lifespan, growth habit, size, speed of growth, and combinations with other plants and landscape features. Maintenance needs of the landscape, including the time or funds available for budget for regular maintenance. You will be presented with a detailed landscape master plan including drawings, plant-material list and cost estimates. Our professional installation crews ensure proper construction and installation according to the landscape master plan. All work is supervised with regular onsite meetings with you to address any concerns and to ensure your complete satisfaction throughout the project. The architecture, construction materials and positioning of hardscapes and outdoor structures should blend in elegantly with the other elements of the landscape and buildings. We utilize the best practices of storm water management in designing and installing processes. Water features, ponds, fountains, sitting boulders and rock gardens. Terraces, natural stone walls and retaining walls. Custom decks, gazebos and arbors. It is critical that the installation/construction of hardscapes and outdoor structures are done by professionals that know how to do the job correctly. From excavating to finishing we use the best construction materials and carefully construct you project to specification and your satisfaction. Whether it is a new commercial property, complete site makeover of a property or just enhancing a specific area, Matteo's Landscaping in South Florida provides you with the commercial landscape design and installation services, including hardscapes and outdoor structures you need. Request a free consultation for your landscape design and installation project today by calling our office at (954) 444-1008 or completing our contact us form - click here.